Well I am feeling mighty sorry for myself. On top of recovery from (very enjoyable) post Christmas socialising and visiting, on top of usual ME/CFS exhaustion, on top of menstrual cramps and back ache, on top of sciatic pain from too many soft sofas and bed … I have a cold. A snotty, chesty, sore, aching, blocked, runny, thumping, feverish, voice losing cold. With it comes many disappoinments. Not being able to draw the pictures I whipped up in my mind and then losing inspiration. Not being able to cuddle with my lovely and have a hopeful, loving, fun new years eve. Not being able to relax after the bustle of xmas (planned so well). Not being able to play with my gifts. An even bigger disappointment … realising my wonder suppliment is so wonderful after all. Not only have I not made the kind of (slight) physical improvement I had hoped for following the increased dosage of Allimax – but it also seems that taking 6 capsules a day has done nothing to fend of the virus that has caused this stinking horrible cold. My faith in it is undermined. I’m not sure if you’ve followed this suppliment use before but I find myself asking – how is going to fight a “stealth virus” in my body when it can’t even fight this cold? I can compare my colds progression with my husbands and whilst I may have an edge over my usual CFS/ME handling of a cold it’s not giving me that much of a boost. Maybe it can be effective in long term use. But having taken it for over 4 months, having increased dosage to 6 capsules a day and having spent a lot of money to do that I’m not convinced I can justify the cost to increase to dose further or to continue. The manufacturers say 10 capsules a day for a week (I think) can cure MRSA. Surely 6 should be combatting a cold? Just 1 capsule is supposed to help me not contract it in the first place. Surely 6 times that is not an unrealistic expectation even if my immune system is comprimised. So until someone can show some extensive effect trials, and offer me a NHS paid version I think this is one guinea pig who is off the experiment. I’ll go back to my tissues and drink some honey and lemon and wait for my body to do it’s best. Please don’t cough in my direction – I’m full to capacity with ickiness right now. You can see every photograph from my daily self portrait project for the first six months in the following two videos. The photographs are shown in chronological order with each video illustrating three months. It’s interesting to view them like this – each day ticking past giving way to the next. I get a real sense of the passing of time. I’ve set the videos to two pieces of music that have made up part of my soundtrack then (and now) and are pieces of music which move me. Is it art? I’m not sure what anyone else will think but to me it is, along with being a diary, a document of life with CFS/ME, a personal insight into coming to terms with my chronic illness, a sketch of life gone by and with it good and bad. It’s slightly unerving to see so many pictures of myself in succession, even more so to see them in a public domain. But trying to communicate something to the others is an important part of the process. I started this project on 4th May 2007, six months after my formal diagnosis with CFS/ME and eighteen months or so after first feeling there was something wrong with me. It’s certainly not a project about vanity. I have to take a photograph of myself every day including some part of me (face or body) and I have to push the shutter button myself (as in self). Every day I take a photo – regardless of how photogenic, creative or human I feel. I’ve had days when my arms are too weak to hold the camera up in the air, days when I can’t get the picture in focus because I’m shaking, days when my head has been so bad the auto-focus light is like a red hot poker in my eye, days when I can’t find words from my brain, day upon day in my pj’s unkempt and unwashed, days when light, life and love gloriously fill my world. Cringe though I might at many of the pictures this process has helped (is helping) me to see, to learn, to grow. Helping me accept life the way it is and the way it must be. Helping to kindle an interest my photography (wanting to do it better). Helping to push myself artistically by addressing the same subject day in day out yet finding new and creative ways to do that. As well as sometimes – just being able to record a moment in a changed life. I am now over 8 months into the year long project. I’m looking forward to finding out what stories this latter half of the project will tell. I had all the routine blood tests, some repeated, none of any concern to the 3 (or was it 4) doctors I saw. So I started a health kick as this lethargic feeling must be due to being out of shape – right? Hmmm. Around this time a year ago, I was forced to abruptly stop my efforts to get back to working full hours as I was hit with (what I now know was) a monumental relapse in my ME/CFS. Fighting to get back to work had only made me more ill than ever – not helped by not knowing what I was really dealing with. This time last year I happened to see Dr H and she gently suggested perhaps this wasn’t just a prolonged recovery from Glandular Fever – perhaps this was Chronic Fatigue Syndrome. She gave me some reading material, told me to see if anything sounded familiar. She gave me a sick note to carry me over Christmas and suggested I go back in the New Year if I still felt unwell and made a double appointment to discuss things further. I was innocently hoping it was just a cold and a couple of weeks off would have me back on my feet. Ha! So this time last year Growler and I started to have private discussions about “what if it IS this CFS thing …” but decided to say nothing to anyone else until we had a confirmed diagnosis. I wrestled (we both wrestled) with the idea that this crappy health of mine was not going to disappear overnight or allow me to fight through to recovery in any way that was at that time familiar to me. Two years ago I knew there was something wrong. One year ago without knowing it I worked my last day in the office and uncovered that what was wrong was no longer in doubt. Xmas Party – You’re Invited! Seeing as how I am kind of limited in what I can do these days and as I hae all these friends in the blogosphere and around the world – I thought a virtual xmas party would be a great idea. This way you can stay as long as you like, wear whatever you fancy, eat and drink whatever you desire (with no ill effects whatsoever)! My way of joining with you for a moment in time to wish you Merry Christmas and send you some warm wishes. There is one thing that chronic illness, incapacity, pain and crappiness cannot take from me and that is love. My love seeps into the lives of my husband, my family, my friends, my cat. It’s not quantifiable, it doesn’t take effort, it isn’t about doing. It’s just love. In return I feel the love from them and it wraps around me. It soothes the worst days and lifts me high on the better days. It never wants for anything. It swells with an openess in my heart and mind. It ever expands with a little trust. It multiplies a thousand fold when returned. Chronic happiness fuelled by love of the simple pleasures – a sunny sky, a tree waving in the wind, a twitching cat dream, a touch of the hand from my husband, a smile, a warm cup of peppermint tea, a smiley on the screen, some LOL. 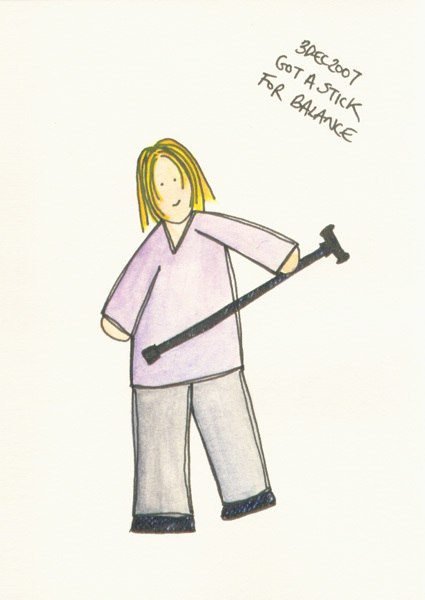 I bought a folding walking stick this week – mainly as an experiment to see if it would help with balance. Um … it does. Which is good news. I use a reacher because my back is bad and it saves some energy from moving about to get stuff. I noticed that when I went upstairs with the reacher using it as stick for support seemed to help. So that, combined with knowing Rachel had success using a stick, inspired me to try for myself. I bought a fairly cheap one (£9.32 plus VAT) but it’s pretty light yet sturdy and I’m rather pleased with it. I am really surprised how much it helps – particularly as I am wiped out this week and really weary. It’s not so much for supporting my weight as my arms are too weak for that, but I can see in a desperate situation (like when I had to stand at my friends funeral) it would be a help. Mainly it’s great for balance. I didn’t realise how much I cling onto furniture, walls and doors before we filled in the DLA claim form and I had to really think about it. Using the stick is like having something to steady myself with that moves with me. I also feel a lot better about the idea of being out in the wheelchair (say at the theatre in December to see the panto) and then walking to the toilet if I have a stick to get me from wheelchair to toilet. Not only will it help with balance but it’s sort of more acceptable to other people I think and will be a visible sign of the struggle I have moving about in those kind of busy social situations.